Daylight saving time began at 2 a.m. today, so let’s take a minute to talk about time. After a failed attempt to end daylight saving time in California in 2016, Proposition 7 passed with 59.75 percent in favor of ending daylight saving time in 2018. It’s going to take time before daylight saving ends in the state. AB 7 needs a two-thirds vote by the Legislature and must be signed by the governor, then will need to be approved by the federal government. The state government is expected to vote on AB 7 this month. While on diplomatic duty in Paris, Benjamin Franklin became the first to suggest shifting clocks forward in the spring and back in the fall to save money on candles. On April 30, Germany became the first nation to enact daylight saving time to conserve electricity. The Germans were fighting World War I. The British followed their lead and introduced “summer time” a few weeks later. The approximate number of countries that observe daylight saving time. They have about one-quarter of the world’s population. 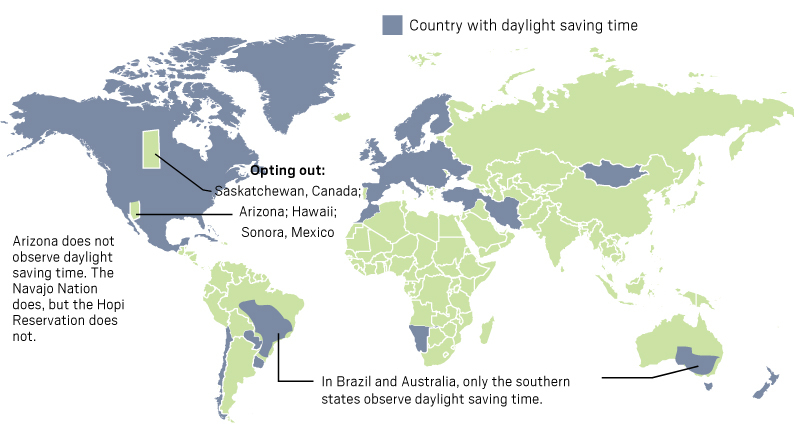 Most countries near the equator have no need to change time for more daylight hours. Daylight saving time is extended from the first Sunday in April in the U.S. to its current length, beginning the second Sunday in March and ending the first Sunday in November. By springing forward the clock, we’ll lose an hour. 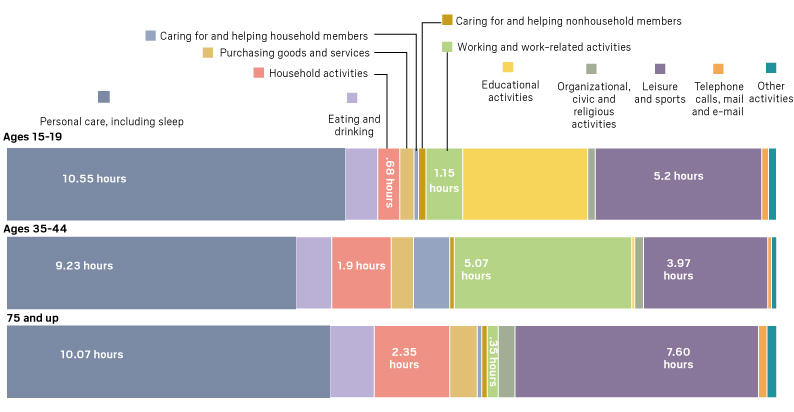 This chart shows the average amount of time per day Americans of various ages spend in selected activities. The data refer to all days of the week and were calculated by the Bureau of Labor Statistics for 2016. With the clocks turning forward, you will lose 3,600 seconds of the day. Not much when you consider there are 86,400 seconds in a day. The first clocks to have a second hand appeared in the 1750s. In formal usage, eons are the longest portions of geologic time after what’s called an era. Less formally, an eon equates to 1 billion years. A blue moon happens on average about every 2.7 years. A seasonal blue moon is the third of four full moons in one season. The next seasonal blue moon is May 18. The second of two full moons in the same month is also called a blue moon. In 2016, researchers at the Max Planck Institute in Germany measured minute changes within an atom on the zeptosecond scale. It is the the smallest measurement of time ever recorded. How small? The number would be sitting 21 places behind the decimal point, or a trillionth of a billionth of a second. A jiffy is a measurement in electronics, computing, astrophysics, and quantum physics. In physics, it is roughly the time it takes light to travel 1 centimeter in a vacuum, approximately 33.3564 picoseconds (a picosecond is one-trillionth of a second). The bolt of lightning that moves upward travels at about 320 million feet per second, which is about one third the speed of light. Thunder is much slower and travels about 1,100 feet per second. Gravity accelerates at 9.8 meters per second, per second. A light object, such as a hat falling from about 6 feet, would travel approximately 7.67 meters per second and land in about .78 seconds. The average heart rate is 72 beats per minute, when one heartbeat occurs every .83 seconds. The 22nd annual Great Backyard Bird Count is underway and continues through Monday. 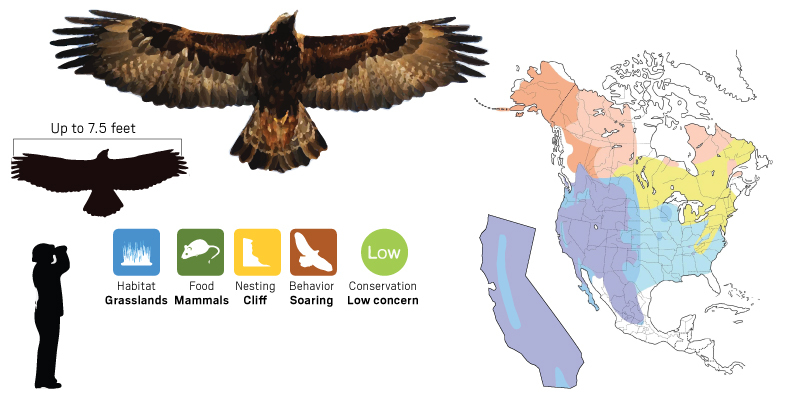 To celebrate, we take a look at a few of the more prestigious raptors of California that have come dangerously close to extinction that you might find in your own backyard. The bald eagle has been the national emblem of the United States since 1782 and a spiritual symbol for Native Americans. 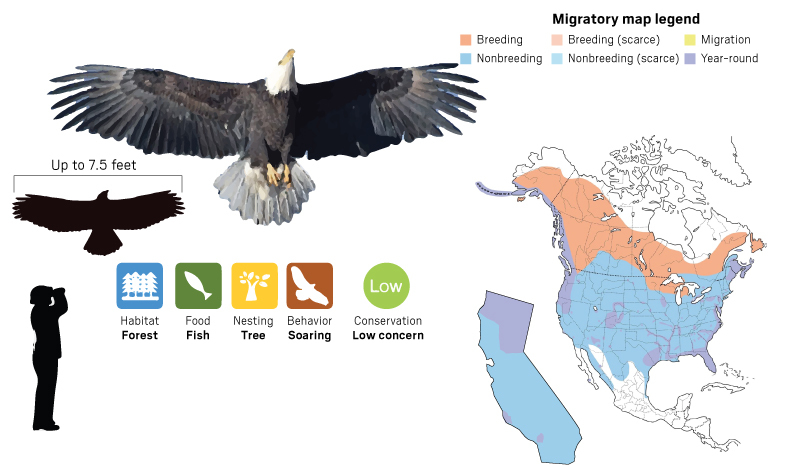 In the late 1960s and early 1970s, the bald eagle was close to extinction in the lower 48 states with fewer than 30 nesting pairs in California, largely due to the use of pesticides. It has made a remarkable comeback with surveys showing that the state’s winter population exceeds 1,000. Golden eagles are found throughout North America, but are more common in western North America. Little is known about the eagle abundance, but it is thought that numbers may be declining in some, if not all, parts of their range. Golden eagle abundance in California is unknown. The peregrine falcon is the fastest bird in the world, capable of reaching 150 to 200 mph in their dives when chasing prey. They were virtually eradicated from eastern North America by pesticide poisoning in the middle 20th century but have made an incredible recovery and are regularly seen in large cities and coastal areas. The white-tailed kite earns its name for the way it resembles a kite in flight. With its body turned toward the wind and wings gently flapping, it hovers above the ground like a kite. 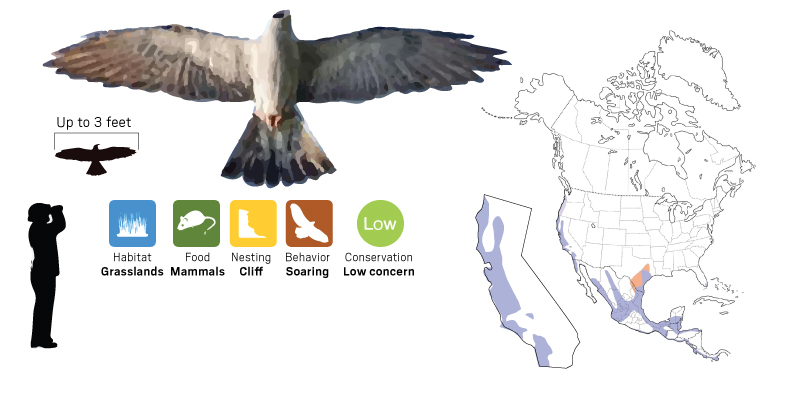 The white-tailed kite was rendered almost extinct in California in the 1930s and 1940s due to shooting and egg-collecting, but they are now common again. Although their distribution is patchy, they can be found in the Central Valley and southern coastal areas. 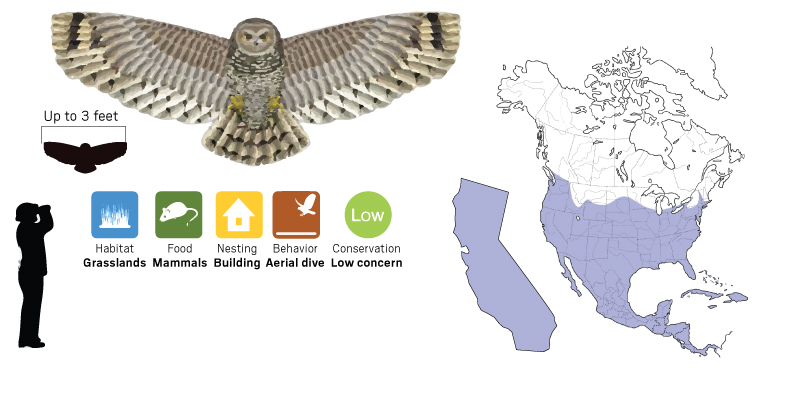 While great stretches of the United States, from New York to Iowa, have seen a decline in barn owls since the 1950s, California maintains surprisingly robust populations due to the abundance of open space of natural grasslands and agricultural fields, where rodent populations increase significantly. Great Backyard Bird Count participants are asked to count birds for a minimum of 15 minutes on one or more days this weekend and report sightings online at birdcount.org. You can see what birds are regularly in your area with eBird species maps. LOS ANGELES — A Garden Grove man pleaded guilty Wednesday to federal charges of illegally importing and selling a highly regulated chemical compound known as R-22 under the pretense that he was actually bringing into the United States a safe refrigerant that does not destroy the ozone layer. Mahmoud Alkabbani, 64, the owner of USA Car Parts, entered his plea in downtown Los Angeles to felony counts of conspiracy to defraud the United States and violating the Clean Air Act by improperly selling R-22 to an undercover agent. He faces up to 10 years behind bars at sentencing June 13, according to the U.S. Attorney’s Office. R-22 is chlorodifluoromethane, sometimes known as HCFC-22, a refrigerant gas and class II ozone-depleting substance. Pursuant to international treaty, the use of R-22 is being phased out around the world. In the United States, pursuant to the Clean Air Act, only parties with unexpended “consumption allowances” are allowed to import the chemical. According to federal prosecutors, Alkabbani entered into an agreement with a Chinese company to purchase 4,000 canisters of R-22, which was packaged in cylinders bearing counterfeit “Glacier” trademarks. The 2013 contract with the Chinese company listed the product as R-134a — which is not regulated by the Clean Air Act and does not deplete the ozone layer — but a second, secret agreement called for the Chinese company to actually sell R-22 to Alkabbani, prosecutors said. In September 2013, Alkabbani offered R-22 for sale on eBay and subsequently made an agreement to sell four cylinders to an undercover agent for $330 each — more than 10 times the amount he had paid for the substance, according to the U.S. Attorney’s Office. During a meeting with the undercover agent, the defendant said he could supply as much R-22 as the buyer wanted with just a few days’ notice. Alkabbani was charged last summer in a nine-count indictment with conspiracy, five counts of passing false and fraudulent papers through a customhouse, and one count each of making false statements, smuggling, and violating the Clean Air Act by improperly selling R-22 to an undercover agent. Wearing 60-pound backpacks, a platoon of prisoners marched Wednesday, Oct. 11 along a narrow trail at Santiago Oaks Regional Park in Orange. Then the dozen or so inched their way up a steep hillside blackened by the devastating Canyon Fire 2. The mission for the minimum-security inmates from the Fenner Canyon Conservation Camp in Valyermo was unglamorous. But it’s essential: Extinguish hot spots and clear brush so the blaze won’t kick up again. And though their freedom was fleeting, relished the tedious work and the chance to be outdoors. Fenner Canyon is among 42 conservation camps in 27 counties operated by the California Department of Corrections and Rehabilitation. It’s north and west of Mt. San Antonio. One aim of the camps is to support state and federal agencies with wildfires, floods and other natural disasters. Most of the camps are strategically located in rural areas so inmate crews can respond quickly to emergencies. Nearly 500 inmates have been assigned to help fight the Canyon Fire 2, said Capt. Larry Kurtz of the Orange County Fire Authority. Inmates must volunteer to work in fire camps. They also must demonstrate an aptitude for firefighting, have minimum-level custody status, be certified as physically fit and complete two weeks of training. Inmates who join fire camps have a day shaved from their sentences for every two days they work. They are paid $2 for each day in camp, and $1 an hour while they are on a fire line. “Getting a $1 hour is huge (for inmates),” said Lt. William Mock, commander of the Fenner Canyon Conservation Camp. The inmates work under the watchful eyes of corrections officers and very few attempt to walk away from fire lines, he added. “I’m learning new skills,” said Heard, who hopes to become a U.S. Forest Service firefighter when he is paroled in 2018. Brian Thorne, a 33-year-old inmate from Pasadena, said the fire camp is an adrenaline rush and allows inmates to be of service. Amanda Fletcher takes a morning kayak trip. Sea lions lounge portside of The Swell. Mortuary poles at UNESCO World Heritage Site at S’Gang Gwaay. Sunlight shines through the trees, highlighting the riot of green growing from the top of a centuries-old mortuary pole, the carved images of a raven and a grizzly bear easier to see in the bleached wood once the watchman points them out. This is S’Gang Gwaay, a village site of the Haida First Nations people, part of the Gwaii Haanas National Park Reserve at the southern tip of Haida Gwaii, British Columbia, a UNESCO World Heritage Site. These are the last remaining totem poles in a settlement that thrived for centuries before being decimated by smallpox in the 1800s. There will be no conservation effort. The Haida believe these burial poles are a representation of the life cycle; once they fall, they will be reclaimed by the forest. It is impossible to stand on this hallowed ground and not feel something – there is a sense of awe but also of urgency – in the knowledge that this special human place will soon be gone but that it will also begin again as something new. I rode on the bow of a wooden boat guided by Maple Leaf Adventures to get here. I sat in front of the wheelhouse under the watchful eye of Capt. Alex Ruurs. My fellow passengers stood around me, pointing out bald eagles, oystercatchers and cormorants sailing past our heads. “Humpback whale breach off the starboard side,” someone yelled, handing me binoculars. We coasted over crystal waters full of spiny sea urchins, stroking the backs of starfish. We watched a black bear feeding at low tide, heard the crunch of crab shells between his massive jaws. We touched the tentacles of a baby octopus and watched the arms of anemones wave in the current before finally arriving on this beach to hike through the woods and stand in front of the totems of S’Gang Gwaay. Known as the Canadian Galápagos because of its wealth of endemic wildlife, Haida Gwaii is an archipelago off the northern coast of British Columbia known as the Queen Charlotte Islands until 2010. Largely covered in temperate rain forest, more than 150 islands form the shape of a bird’s wing – the largest, Graham and Moresby Islands, in the north, and the smaller collection of Gwaii Haanas to the south. To the east there is Hecate Strait and the mainland; to the west, the straight drop of the continental shelf and the open waters of the Pacific. This is a place of possibility – where, if you listen, you might just hear the earth breathe. a native Canadian like me, who has made her home in Southern California for most of her adult life, it’s some strange alchemy that lets me be in both places at the same time, like living inside my own deepest desires. Selected for Canada’s Signature Experiences Collection by the Canadian Tourism Commission, Maple Leaf Adventures has provided conservation-focused big adventures aboard small ships since 1986. Smith has created “eco-adventure cruising,” using the principles of preservation, education and hands-on experience to offer a unique experience for travelers who crave more than a superficial, just-passing-through kind of trip. This is not your average cruise ship. It’s a 88-foot converted tugboat, known as the Swell. Built in 1912, it hauled other ships for close to a hundred years. After $4 million-plus in renovations, it’s a passenger vessel of incomparable beauty, its interiors paneled in polished wood, its silver portholes gleaming. Morning kayak trips mean searching the shore for bears but also taking photos of our boat, the snow-topped peaks and a forest of trees reflected in the water around it. It is impossible not to feel lucky. Swell accommodates up to 12 guests in six cabins with high-thread-count sheets and limited-edition prints. Every room has its own bathroom, every shower runs hot, and you can drink the water straight from the tap, thanks to a state-of-the-art desalination system. day with expectation. On this trip, anything could happen. Between expeditions ashore, from Tanu to Rose Inlet and back to Windy Bay, guests fish off the side of the boat and the crew drops baited traps in the hopes of further enhancing our three-course, locally sourced meals. Who wouldn’t want to add an appetizer of Dungeness crab to the pan-seared salmon with black beluga lentils and farro from Alberta? On Haida Gwaii, really anything can happen. Named one of the 50 Tours of a Lifetime by National Geographic Traveler, Haida Gwaii is “best experienced without expectations or itineraries” because Mother Nature makes her own plans. Excursions begin with a land tour of the inhabited islands, an overnight at Alaska View Lodge in Masset, and an afternoon at Skidegate’s Haida Heritage Centre. While the Swell has a loose idea of where it’s headed, once it’s boarded in Cumshewa Inlet, our crew meets in the wheelhouse every morning to make adjustments to the day’s plans, contingent on the weather, whale sightings or potential foraging expeditions. One thing is constant, however: Every evening the captain steers into a quiet inlet along the route where the water is like glass, so you can enjoy your cr¯me brûlée without having to stop your utensils from rolling off the table. After dinner, while guests lounge on the aft deck under a yellow cedar carving by Tim Motchman, sipping their last glass of a B.C. wine, the engine is turned off. Any overnight power needs are supplied by a silent bank of batteries. This is a powerful place, where the ties between things feel especially strong. It’s a common theme in Haida mythology, where humans are found hiding in the eye of a killer whale, beneath the skin of a bear or their limbs protruding from a clam shell. And after talking to one of the watchmen on Tanu, it’s obvious they don’t put much stock in linear time either. Children are believed to be the reincarnation of their elders. They are given the same names, and the actions of their namesake are attributed to all – past, present, future and supernatural. Stories are relayed in the collective “we” and take place in the ever-present now. I am comforted by this way of looking at the world, the importance of community. My mother died when I was very young, yet I can feel her presence here like she is hiding within my skin. Making my way into the forest on a path that stretches out in front of me like a spine, it is her feet I see, one in front of the other, her hands reaching for my camera. And when we finally spot a pod of orcas – even after being told it probably wouldn’t happen – the captain stops the engine and lowers the hydrophone into the water so we can listen in. I hear these killer whales talking and I recognize their cries immediately: It is the sound of my heart I hear, calling out to my mother. Haida Gwaii. These things happen here. Anoosheh Oskouian is trying to commit to getting at least six hours of sleep a night instead of four because it’s healthier – not necessarily because she’s tired. As the rare female CEO in the environmental engineering industry, she thrives on her hectic schedule. During the 18-20 hours she is awake, Oskouian is busy running Ship & Shore Environmental Inc., hitting the gym, spending time with her 13-year-old son, Rod, and her husband, Alan, preparing family dinners, organizing and attending charity events, reading poetry, and going to the symphony. People often ask her where she finds the time. “Whenever you want to get anything done, give it to a busy person,” she says with a laugh. As if to illustrate that point, she describes how she spends her free time, which includes co-founding Children’s Hope International Literacy & Development, a nonprofit that helps children further their education and provides basic necessities. Oskouian is a board member of the Pacific Symphony and has fundraising, committee and board positions in several other nonprofits. Born in Iran, Oskouian founded the engineers and architects division of the Network of Iranian American Professionals of Orange County and participates in Orange County’s Strategic Business Group, a networking group of Iranian American professionals. What’s more, she helped develop the Iranian Cultural Center of Orange County and is a trustee of the Farhang Foundation, whose mission is to promote Iranian art and culture for the benefit of the community. If there is a moment to spare, you can find Oskouian relaxing in her coastal backyard. Why I live here: We moved to the neighborhood almost 10 years ago because we wanted our son to go to school with the kids from the neighborhood and living on the coast was a preference. Where I’m from: I came alone from Iran to Colorado for school when I was 14, for the dream of living in a country where freedom was of the utmost importance. What I do: I am president and CEO of Ship & Shore Environmental Inc., which does engineering, consulting and manufacturing of anti-pollution control systems. My field of study was chemical engineering, and I wanted to do something that I could feel the impact of. What I am passionate about: I truly enjoy knowing that I have made a difference in the air we all breathe. I also love cultural activities and philanthropic causes that involve children; my heart aches to be able to make a difference in a child’s life. How I personally reduce my carbon footprint: We try to live a conscious life. We are proud owners of a Tesla and another hybrid. We’re also in discussions to get solar panels on the house. We recycle, and we conserve water by changing our landscaping. My perfect day: I’d love for my day to start with a great workout, then I’d like to have a lot of time to spend with my husband and my son, and after that I would tend to business. If I am in town, I love to be at home cooking and spending time with my family. And, if I am not having dinner at home, another perfect way I can spend the evening is to attend a charity or music-related dinner. My sanctuary: One of the places I truly love is Sedona, Arizona. There is a resort there called Sanctuary. It’s a beautiful spot; I absolutely love the hiking. Red or white: I love them both. At cocktail parties I start with a white and hopefully get a red after that. On my nightstand: A Bose clock radio and a few books that I flip through. Some never leave my nightstand, including “The Power of Now” by Eckhart Tolle and two Persian poetry/philosophy books. I usually pick one and read some verses. “The Power of Now” is almost like a little Bible. I pick it up and, whatever page I open to, I feel like it must have been calling me to get me aligned with the universe again. Pet peeve: I can’t stand laziness and incompetence. How I relax: Driving relaxes me because I get to be in my own head and my own thoughts. I try to make the best of the time I have in the car. There are certain things you have to do in life – like drive – in Southern California. There is nothing you can do about it. You might as well try to make the best of it. I have classical music on when I am driving, which is really comforting. A scene from “Jaws” that sums up how the movie made an entire generation of kids feel. A sign at San Onofre after the recent shark attack. A radiation leak warning might be less frightening. Breathe, breathe….and remember: fascinating, not fear-inducing. Ocean Ramsey swims with a great white shark in her YouTube video. After penning, “Jaws,” the author became an advocate for protecting sharks. A great white clears the lineup at Capistrano Beach in Dana Point. Don’t worry, though, he’s hunting fish, not humans. I was 9 when the movie “Jaws” came out. My otherwise smart parents decided it was a good idea to expose a child who lived on an island, Balboa, who went out in a boat weekly and who was an avid surfer, to a movie in which an enormous rogue shark terrorizes an island full or swimmers and boaters. In fact, the weekend I saw “Jaws,” we went to our Palm Desert condo, where I was afraid to go in the pool. In the desert. Big Corona and 54th Street were out of the question. And I wasn’t alone. After “Jaws,” an entire generation saw sharks as vicious man-eaters and indiscriminate killing machines that targeted humans. B-movie sensationalism trumped reality. Let’s just say Steven Spielberg owes us a few summers. But, fortunately, Orange County turned out to be a shark-free zone. There was the very occasional sighting, of course, but there were exactly zero confirmed attacks during my high school and college years. So, eventually, I returned to the ocean and got over my fear of what one of the characters in “Jaws,” Hooper, referred to as “a perfect engine, an eating machine.” For the next few decades I surfed, I swam, I even spearfished for dinner without a worry. Then came 2015 and the sharks seemed to revert to 1975 cinematic terror tactics, attacking anything in a bathing suit. Suddenly I surfed with my legs up. I swam with the “Jaws” theme pumping through my mind. And spearfishing, my true passion? That was about as relaxing as hand-feeding a lion. The problem only got worse. Shark attacks in 2015 and 2016 hit record numbers in many places, and in usually safe Orange County, there were two shark attacks in 11 months. To put that in perspective, according to the University of Florida’s International Shark Attack File, there were four confirmed unprovoked shark attacks in Orange County from 1926 through 2017. And worse were the shark sightings, which became a daily headline: Great White Sharks Surround Paddleboarders, Shark Attacks Hit Record High, Rogue Family of Great Whites Kills 6 in Thanksgiving Day Feast. OK, that last one I made up, but my fear was not fictional. My relationship with the ocean, the one thing that provided me calm and solace and kept my life on track, was in peril. I called Suzanne Anthony, a clinical psychologist whose clients include young kids who are scared to go in the ocean for fear of sharks. She helps terrified 6-year-olds, so I gave her an outside shot at helping me. I told Anthony I needed to stay calm while I surfed, swam or chummed up the ocean with bloody fish guts while spearfishing. I told her I needed more for $90 an hour. Anthony said she’d help, but when I ventured offshore to spearfish in sharks’ natural habitat, I was going up against the primitive human fears of being eaten by a large apex predator and the fear of the unknown triggered by that big, blue foreign environment. “Typically, what happens in the human brain when we have an unknown is we fill in the blank with the worst-case scenario,” she said. It goes back to caveman days; the best way to stay alive is to treat anything unknown as a threat to survival. It’s why “Jaws” worked so well. Faced with three malfunctioning sharks that were ruining his budget, Spielberg came up with another plan: show the shark as little as possible, playing on the fear of the unknown lurking beneath the surface. Bingo, a box office hit and a terror so intense that almost 40 years after scaring me out of oceans, pools and nearly the bathtub, it was still ruining my dives. So to secure my love of life on the ocean, I had to get over my fear of sharks by diving with them. A lot. And not get eaten. That not-getting-eaten part was really the key to knocking down the fear. Of course, that was only half of the cognitive behavioral therapy Anthony prescribed. The other part involved the rational thought process (the cognitive part): talking to shark experts and learning the facts – such as I’m less likely to die from a shark attack than from a deer in the road, a vending machine falling on me or just falling out of bed. Anthony admitted that my goal was a bit tougher due to the uptick in shark attacks. Not necessarily because my chances of getting attacked had risen, but because of media exposure. “Even though shark attacks are low-incident occurrences, because they’re everywhere in the news, our brain interprets them as highly likely. Our brains get tricked,” she said. Right, I thought, this whole fear of sharks thing is just silly. I mean, I’m the father of a teenage girl with the last name Loose. I can handle anything. I started to feel pretty darn good. “Maybe I could pay you more to say less,” I said. Before working on the exposure therapy, I decided it was far less terrifying to call a shark expert and work on the cognitive therapy. So I contacted Chris Lowe, the director of Cal State Long Beach’s Shark Lab and one of the country’s most respected shark experts. I asked him if I was crazy to want to get more comfortable with sharks in a period when shark attacks are on the rise. So, I asked, can I assume that when I see a shark while in a column of chum or fighting a speared fish, the shark is more interested in the fish than me? Lowe believes there are two reasons California is seeing such a surge in shark sightings. One is that El Niño kept the sharks from migrating south to Mexico in search of warmer water. The second is that over the past 15 years, shark populations have increased because of the protection and recovery of marine mammals, their food source. All the more reason for humans to get comfortable with sharks. So I asked Lowe what the best course of action is when encountering a shark. Going toe to fin with an apex predator seemed like a big leap, so I decided a nice baby step was a shark cage dive, which I did just a week later. And while the experience was awe-inspiring, it was sort of like watching lions at the zoo, where there’s a moat, a fence and 20 slower tourists between the lions and me becoming lunch. To really overcome this fear, I was going to have to swim with sharks – without a cage, without a spear gun and, hopefully, without any punching. Blond, beautiful and weighing in at a little over 100 pounds, Ocean Ramsey is not, on first glance, someone you would bet on being a respected shark expert who swims with very large predators daily. But that is her passion, which is why she and fellow shark expert Juan Oliphant founded Hawaii’s One Ocean Diving, which takes people 3 miles offshore to swim with sharks. To change that, a few years back she and Oliphant made an anti-“Jaws” film. In “Jaws” the blond girl gets eaten. In their YouTube version, Ramsey is seen swimming with a very large great white shark in the waters off California. It generated much-needed good press for sharks. “I realize we still have a long way to go. There are still a lot of people in the old ‘Jaws’ brainwashed and ignorant mindset that will take some time to undo,” she said. But undo it we must, because we need sharks for the health of the oceans and, ultimately, our own survival. That may seem ironic with the wave of shark attacks in recent years, but Ramsey said nothing could be further from the truth. “Sharks are the immune system of the ocean. They remove the dead, dying, weak, sick and injured animals and leave only the healthiest to reproduce, keeping everything in balance,” she said. Unfortunately, every once in a while, our graceless swimming can mimic those sick, injured animals. In return for their help in sustaining our oceans, humans massacre 70 million to 100 million sharks per year – about 11,000 per hour – through culling, longline bycatch, and, mostly, finning for soup. approached the dive spot. I was thinking more about a recent study that found that while sharks are indeed an apex predator – a 5 on the trophic scale of 1 to 5 – we humans are more like a 2.2, on the same level as anchovies and pigs. It’s merely our arrogance and technology that allow us to act as apex predators. The boat pulled up to a buoy and the engines shut off. Suddenly, my homo sapiens arrogance sank away and I felt very anchovy-like. Ramsey, on the other hand, was beaming like she was about to see her best friends. She jumped in first and reported back. “We have 13 sharks,” she said happily. So, I thought hopefully, that’s too many to dive with, right? I hit the water and took a look around. Sharks everywhere. Mostly 6- to 10-foot Galapagos with a few 6-foot sandbar sharks mixed in. They swam mere feet below, making large, sweeping circles. A few swam directly at me, coming close enough for me to see the texture of their skin, the details of their eyes, the sharpness of their teeth. But after only a few moments I noticed something very strange and unexpected. My heart rate was normal, as was my breathing and my stress level. In fact, far from causing anxiety, the sharks were having a calming effect. Just as Ramsey promised, the way they glided through the water with controlled confidence, establishing dominance without threat, was more fascinating than fear-inducing. It was hard to believe that these creatures were related to the so-called monsters that had generated so many recent headlines. By the end of our 45 minutes in the water, 27 sharks had shown up, while my anxiety had gone way down. I have now been in the water with hammerheads, tigers, Galapagos, sandbars and oceanic white tips. I have, on rare occasions, felt slightly threatened. But in every case, a gentle poke with my spear tip or just a firm stare has sent the shark on its way. I’ve lost a lot of bait and a few fish to sharks, but not once has it spurred a feeding frenzy. I treat sharks with respect, and they seem to treat me with respect in return. Which I’d say is pretty darn decent of them considering I’m on par with an anchovy.